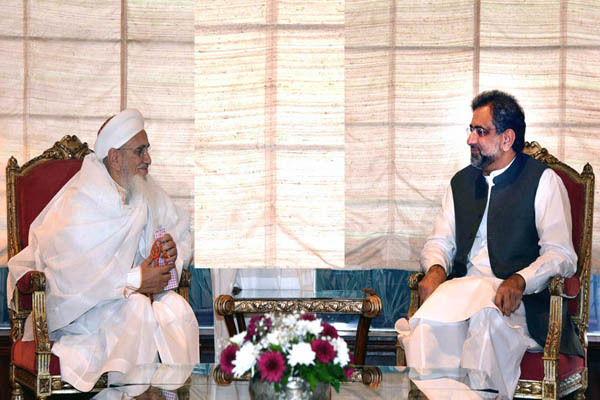 ISLAMABAD, Oct 9 (APP):A delegation of Dawoodi Bohras community, headed by Da’i al-Mutlaq Syedna Aaliqadr Mufaddal Saifuddin Monday called on Prime Minister Shahid Khaqan Abbasi at PM Office here. During the meeting, the prime minister appreciated the contributions of Bohra community in social welfare and economic sectors. He assured the delegation that the government would continue to provide every possible support to the community in its humanitarian and social works. During the meeting, Syedna Aaliqadr Mufaddal Saifuddin appreciated the arrangements made by the government to facilitate the Bohra community during the events in month of Muharram this year. The meeting was attended by Shahzada Idrees Bhaisaheb Badruddin, Shahzada Jaffarussadiq Bhaisaheb Imaduddin, Shahzada Taha Bhaisaheb Najmuddin, Shahzada Husain Bhaisaheb Burhanuddin, Sheikh Kumail Shaikh Yunus Bhai, Hussain Bhaisaheb Shaikh Kumail Bhai, Shaikh Saifuddin Bhai Zoomkawala, Shaikh Zulfiqar Ali Adam, Shaikh Mohammad Hussain Poonawala and Shaikh Mustansir Poonawala. Minister for Religious Affairs Sardar Muhammad Yousaf was also present during the meeting.